Improper seating can have a detrimental effect on a worker's health and motivation, it also reduces productivity, leads to a higher than average probability of industrial accidents and reduces product quality. 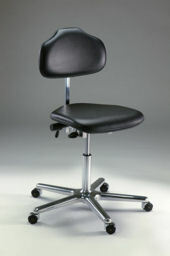 Our industrial workseats provide for precise adjustment of seat tilt, seat height and back support. 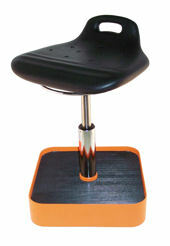 This gives each worker the ability to adjust the seat to their body posture, minimizing physical strain and injuries. All adjustment options can be executed while the operator is seated. We offer a wide variety of options and accessories to fit any industrial environment such as upholstered seats, polyurethane seats, wood seats, swivel bases, castors, arm rests, step rails and foot rests. Workseats come in a variety of designs and constructions and can be engineered to the user's specifications. We recommend, based on the application, Budget Chairs, Stainless Steel Chairs, Electrostatic Chairs, Clean Room Chairs and Standing Support. 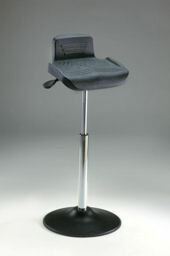 • The backrest is of swing design and offers a permanent and adjustable backrest pressure. 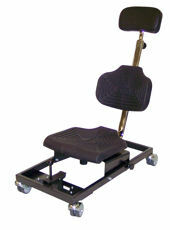 Consequently, it follows the movement of the upper body and can be adjusted depending on the weight. 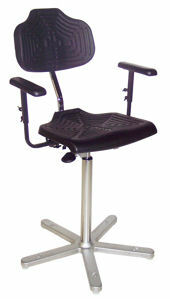 The spinal column is supported effectively and the ergonomically favorable “dynamic sitting” is achieved. • Anatomic seat design with ergonomically rounded front edge provides optimal pressure distribution and seat angle adjustment from – 4 to +10 degrees.